This update includes the final batch of transcriptions of Massachusetts vital records in the NEHGS 1841–1910 database. There are 656 Sacket/Sackett records (of which 5 images are missing). Despite taking care in transcribing, there are likely to be some errors, especially with initial capital letters, which the 19th century clerks contrived whenever possible to make look the same. If records appear not to agree with data from other sources, please ask and I will re-check the transcription. 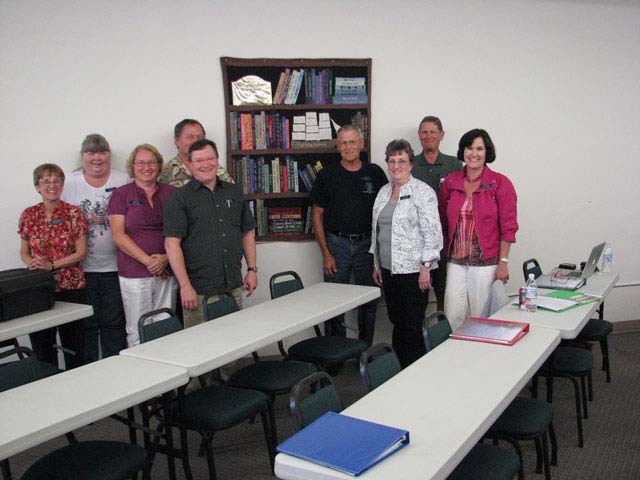 Many thanks to Don and Glenna Hertzler for providing, respectively, a reunion picture gallery and the minutes of the Association meeting held during the reunion. The 2010 Sackett reunion in Portland, Oregon, was much enjoyed by the 29 members attending. Convener Kathryn James arranged a full program of activities, and advantage was taken by members, both new and old, of every opportunity for discussions. Plans are already being formulated for the next reunion, to be held in the Fall of 2012 in the north east United States. 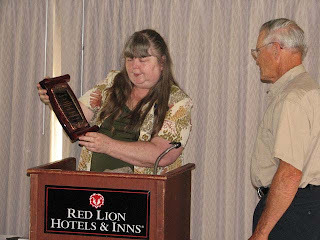 Thurmon King, historian of The Sackett Family Association since its formation, was honored at the 2010 reunion in Portland, Oregon, for his huge contribution to the research of the Sackett family. He was presented with a plaque by reunion convener Kathryn James on behalf of the Association. Starting with Weygant's The Sacketts of America, Thurmon has built a database of some 34,000 individuals, and never misses a lead to more information on the Sacketts.